I have been really into trying new and fun toasts lately. It is definitely not just me though – toast is trending. 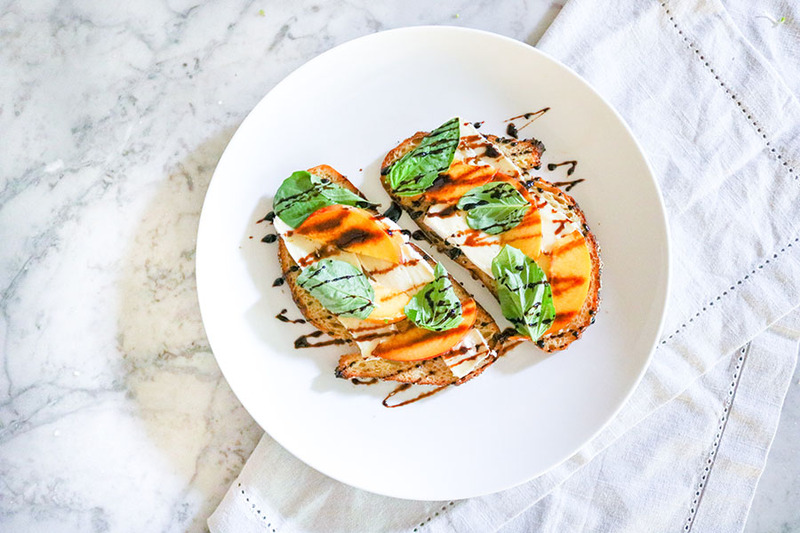 Sweet potato toast, avocado toast, nut butter toast – its all so delicious and fun! 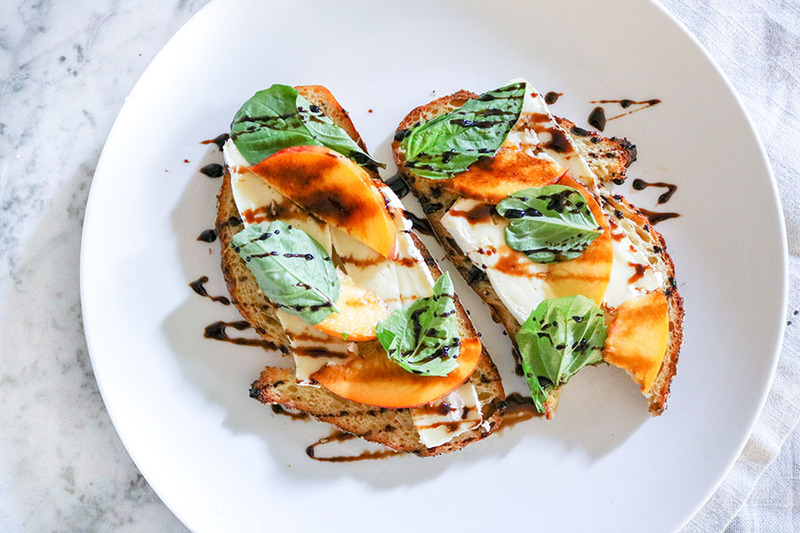 This Camembert and Peach Toast with Balsamic Glaze is no different – Creamy camembert, juicy peach, and fresh basil make for a taste bud blasting combination – drizzle with balsamic glaze and you’ve got straight up perfection. You can enjoy this Camembert and Peach Toast fresh or baked. With fresh toast, you can enjoy the juicy, bright taste of that cute babe peach. With baked toast, your camembert is going to get all kinds of creamy melty delicious – and your peachces will become caramelized. Seriously, both are droolworthy. And then there is the balsamic glaze… woah. 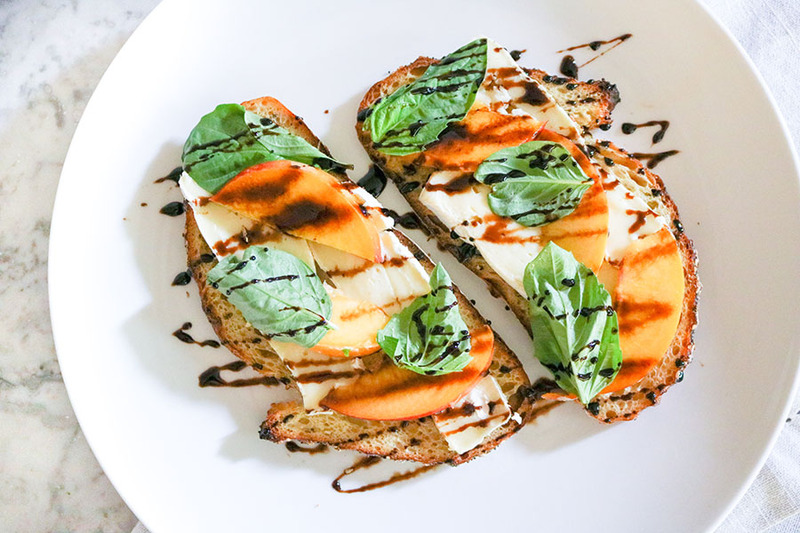 Balsamic glaze just sounds fancy… doesn’t it? You see it at restaurants all the time. But have you ever made it yourself? I never had! 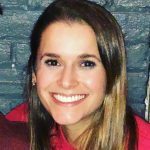 Turns out – it is SO EASY! Two-ingredients, a saucepan, and about 10-15 minutes is all you need! Interestingly enough, just like fresh herbs – balsamic glaze seems to make almost anything I have put it on taste better! Tomatoes, basil, cheese, cucumbers, sprouts – okay so that is about all that I have enjoyed it with so far… BUT ITS ALL BEEN AMAZING! And seriously, it was SO easy to make. It is amazing how small additions like fresh herbs and a balsamic glaze can be so simple yet add so much flavor! 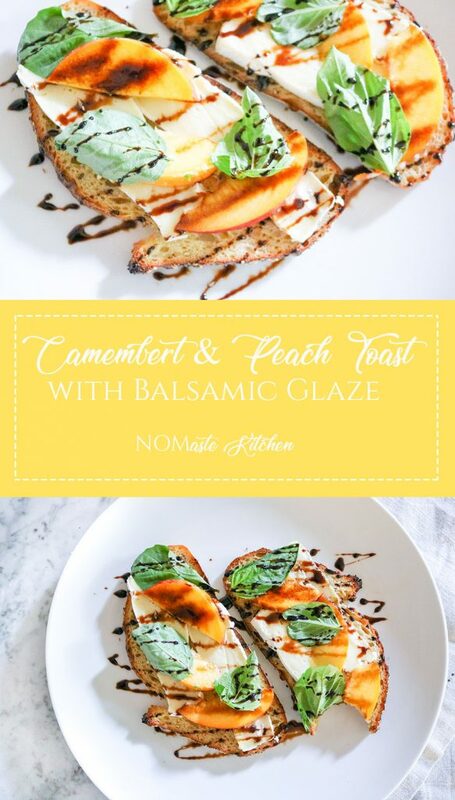 Like all my recipes – feel free to make this Camembert and Peach Toast your own! Camembert is MY favorite cheese, but I am sure many cheese would taste fab in this. Brie, duh. Goats cheese – I am sure would as well. Fresh mozzarella – DEFINITELY. As for bread, this is also totally your choice! I used a freshly baked semolina bread from Amelia’s Breads! I also LOVE the Tuscan Pane at Trader Joes – it is so freaking good. But feel free to use any bread your heart desires! 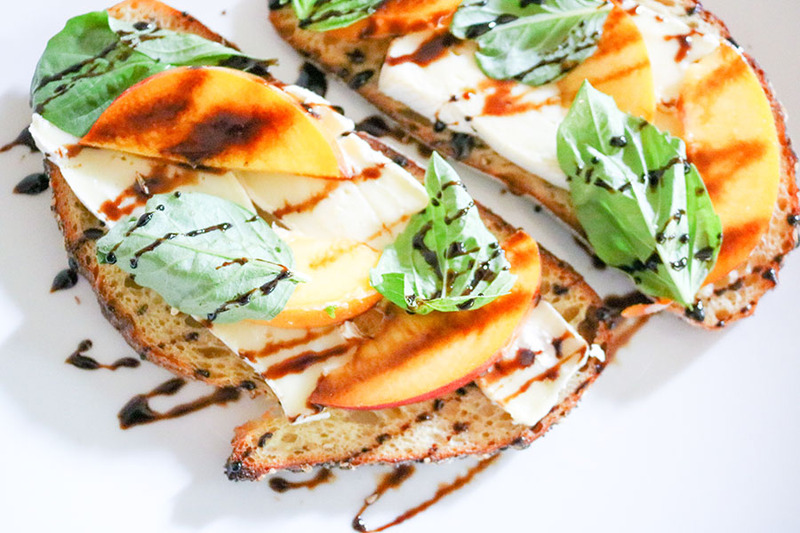 Serve this Camembert and Peach Toast up as an easy appetizer or lunch! I promise, you’re going to love it! 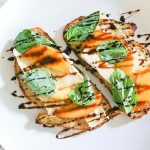 Creamy camembert cheese, juicy peach, and fresh basil make for a wonderful summer toast - top with an easy balsamic glaze and you've found perfection. In a small saucepan, combine balsamic vinegar and honey - heat over medium flame until boiling (careful to watch while boiling because vinegar level in pan will rise). Lower heat and simmer for about 10 minutes, until mixture thickens, stirring occasionally. Remove from heat and allow to cool - recipe yields about 1/4 cup of glaze. Toast bread in toaster (or toaster oven) as desired (if you do not have a toaster, you can heat bread in a large skillet with 1-2 tsp olive oil. Remove bread from toaster or pan and set on plate for assembly. 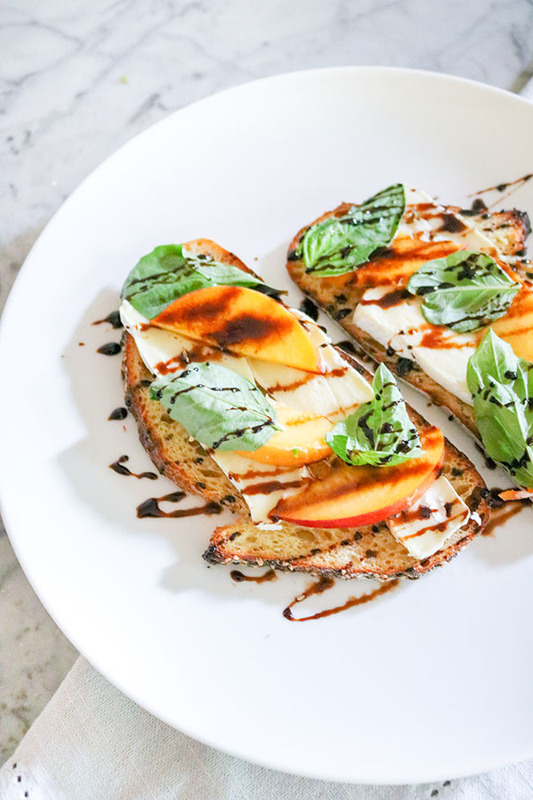 Layer camembert, basil and peach on top of warm toast. Drizzle with balsamic glaze (you will have extra). Serve immediately. Preheat oven to 350F. Layer camembert and peach on top of bread. Bake at 350F for 10-12 minutes, or until bread begins to crisp and cheese becomes melty. Remove from oven, top with fresh basil then drizzle with balsamic glaze. Storage: Best enjoyed right away.